A lumbar peritoneal (LP) shunt is a technique of cerebrospinal fluid (CSF) diversion from the lumbar thecal sac to the peritoneal cavity. It is indicated under a large number of conditions such as communicating hydrocephalus, idiopathic intracranial hypertension, normal pressure hydrocephalus, spinal and cranial CSF leaks, pseudomeningoceles, slit ventricle syndrome, growing skull fractures which are difficult to treat by conventional methods (when dural defect extends deep in the cranial base or across venous sinuses and in recurrent cases after conventional surgery), raised intracranial pressure following chronic meningitis, persistent bulging of craniotomy site after operations for intracranial tumors or head trauma, syringomyelia and failed endoscopic third ventriculostomy with a patent stoma. In spite of the large number of indications of this shunt and being reasonably good, safe, and effective, very few reports about the LP shunt exist in the literature. This procedure did not get its due importance due to some initial negative reports. This review article is based on search on Google and PubMed. This article is aimed to review indications, complications, results, and comparison of the LP shunt with the commonly practiced ventriculoperitoneal (VP) shunt. Shunt blocks, infections, CSF leaks, overdrainage and acquired Chiari malformation (ACM) are some of the complications of the LP shunt. Early diagnosis of overdrainage complications and ACM as well as timely appropriate treatment especially by programmable shunts could decrease morbidity. Majority of recent reports suggest that a LP shunt is a better alternative to the VP shunt in communicating hydrocephalus. It has an advantage over the VP shunt of being completely extracranial and can be used under conditions other than hydrocephalus when the ventricles are normal sized or chinked. More publications are required to establish its usefulness in the treatment of wide variety of indications. Stroke or "brain attack" is a complex disease caused by a combination of multiple risk factors. It has major social and economic consequences. Various epidemiological studies in families and twins have revealed that there is a genetic component to stroke risk. Stroke may be the outcome of single gene disorders or more commonly, a polygenic multifactorial disease. Mutations in several candidate genes have been found to be associated with stroke. However, association studies in population-based samples have failed to identify reliable disease markers. 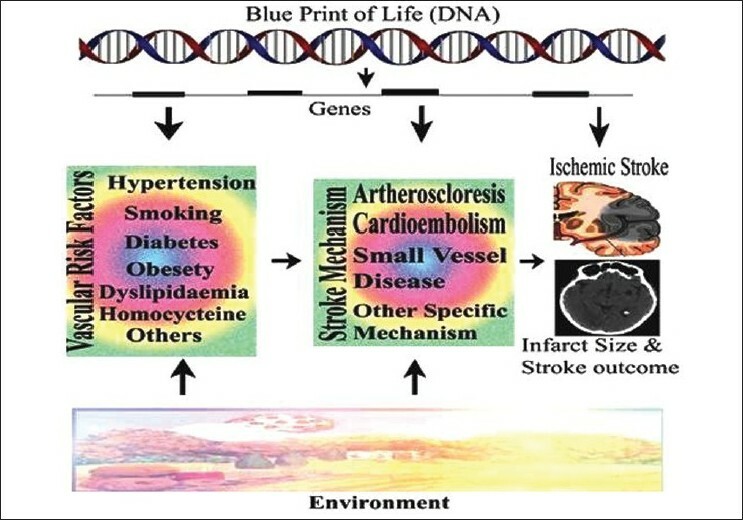 The publication of the "Human Genome Project" has indeed improved our knowledge about the potential role of genetics in complex disorders including stroke. Rapidly expanding field of genetics is in a state of transforming medicine into a new kind in future, the individualized medicine, using tailor made drugs according to the genetic makeup of the individuals. However, this involves integrating genome wide genetic information with medical information. The first genome wide association study on ischemic stroke has been published recently. Further studies will hopefully tell us how far the genetic information will assist us to tailor clinical and therapeutic decisions to an individual's genotype. Background: Atherosclerosis is the most common cause of ischemic stroke. Until now, there has been no ideal animal model for studying the hemodynamic ischemia caused by atherosclerosis in posterior circulation. Objective: This study was conducted to establish a cerebral ischemic model in an atherosclerotic rabbit by subclavian artery (SA) ligation or embolization, emphasizing the role of hemodynamics. Materials and Methods: Thirty-two male New Zealand rabbits (weight, 3.5 to 4.0 kg; provided by Animal Laboratory of Tongji Hospital of Tongji University) were randomly divided into four groups. All the groups, except the controlled group, were fed with high lipid diet for three months and two of the groups were submitted for right SA ligation or left SA embolization and the remaining one group to non-operated group. Results: A SA steal syndrome was established successfully with delayed visualization and prolonged circulation time in the posterior circulation. The circulation time was different when SA was ligated or embolized (P < 0.001), and also there was statistically significant difference between controlled and non-operated groups when angiography of either, left and right, VA was performed (P = 0.009, P = 0.003, respectively). However, there was no statistical significant difference between the ligation and embolization group either before or after the procedure (ligation or embolization) (P = 0.402, P = 0.068, respectively). In the control and non-operated group, angiography of either left or right VA showed no statistically significant difference (P = 0.285, P = 0.197, respectively). In the groups fed with high lipid diet for three months, atherosclerotic plaques were found in the common carotid arteries (CCAs), aortic arch (AAs) and variably in the internal carotid arteries (ICAs). Conclusions: This model could, to some extent, simulate the clinical hemodynamic state of atherosclerotic stroke. and it is an ideal model for studying the hemodynamic cerebral ischemia in posterior circulation. Background: There is no effective axon regeneration in adult mammalians. Objective: To investigate the effects of dual-acid cyclic adenosine monophosphate (db-cAMP) on the axon regeneration, motor function recovery and RhoA signal pathway in cerebral ischemia-reperfusion rats, and to explore the possible clinical application and mechanism. Materials and Methods: Middle cerebral artery ischemia-reperfusion model was established by nylon monofilament occlusion method in 105 Sprague-Dawley (SD) rats. Semi-quantitative Western blot analysis was used to assess protein expression level of growth-associated protein-43 (GAP-43) and RhoA. 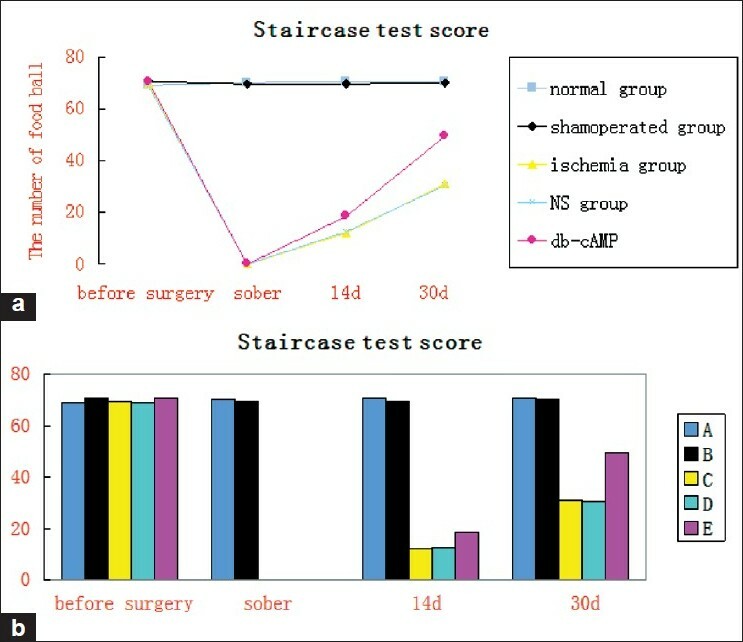 Montoya staircase test score was used to test the motor function of affected forelimb. Results: Compared to the ischemia group, the staircase test score in the db-cAMP group was increased significantly at 30-day (P < 0.05), and GAP-43 protein expression in the db-cAMP group was enhanced significantly at 7-day and 14-day (P < 0.05), and RhoA protein expression in the db-cAMP group was decreased significantly between 24 h to 14-day (P < 0.01). Conclusion: These results show that db-cAMP can promote axon regeneration and the recovery of motor function by inhibiting RhoA signal pathway. Background: Bone marrow mesenchymal cells have been identified as a source of pluripotent stem cells with varying degrees of plasticity in humans. However, there are a few reports on rat-derived cells, which could be good models for the research purpose. We describe here a simple method of establishing the rat bone marrow stromal cells by the principle of adhesion and document their phenotype along with their differentiation potential to other lineages. 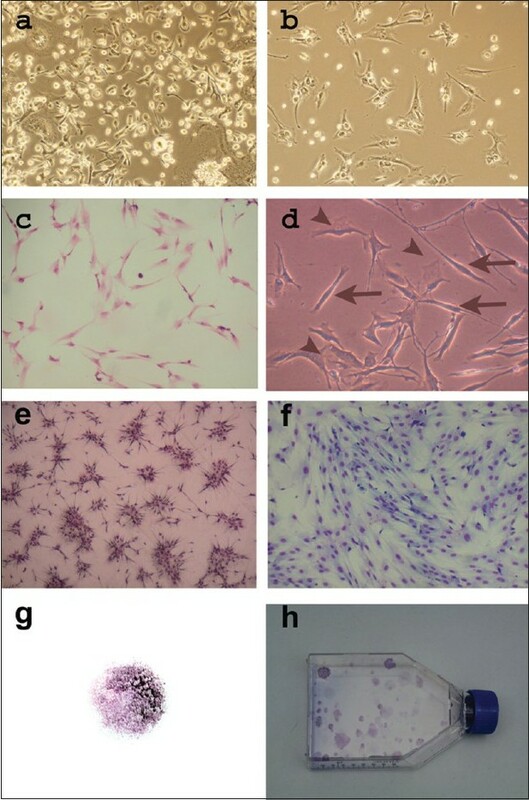 Materials and Methods: Rat bone marrow stromal cells were isolated by three methods: direct plastic adherence, ficoll hypaque separation and a combination of both. The stromal cells obtained by these methods were characterized by fluorescent activating cell sorting (FACS) for established hematopoietic and non-hematopoietic markers. The cells obtained by combination method (combination of ficoll density gradient centrifugation and plastic adherence) were cultured and serially passaged. Transcriptional confirmation was done by reverse transcription polymerase chain reaction (RT-PCR) for vimentin and collagen type 1 alpha 1. Attempts were made to differentiate the marrow stromal cells into adipocytes, osteocytes and neuronal like cells. Results: Bone marrow samples from 10 rats yielded 4-5 million bone marrow mononuclear cells /ml per femur. Of the three methods tested, a combination method yielded good growth of spindle cells. The cells obtained by combined method showed high percentage of positivity for vimentin, fibronectin and CD90 and negative for hematopoietic markers. Further, RT-PCR confirmed vimentin and collagen type - 1 alpha 1 expression. 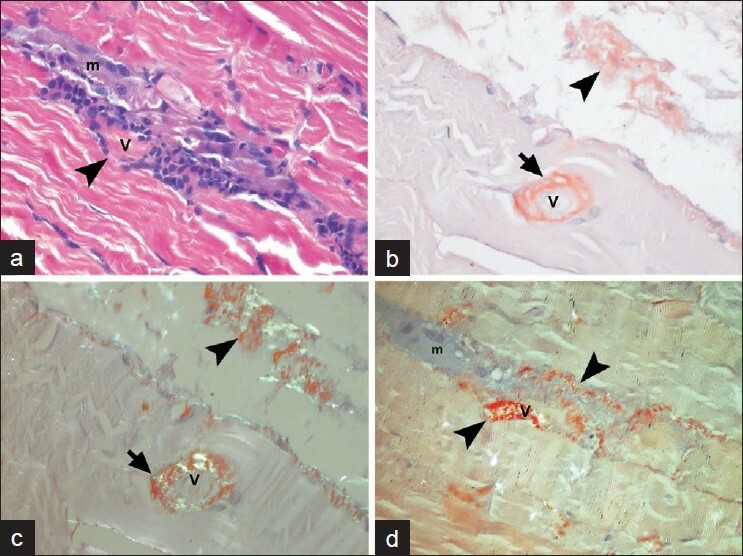 Oil red O staining and Alizarin red staining confirmed adipocytic and osteogenic differentiation. On immunocytochemical analysis, the cells expressed nestin, β-tubulin III, neurofilament and synaptophysin. Conclusion: Adequate quantities of rat marrow stromal cell cultures can be established by a simple method based on adhesion properties. Their phenotypic characteristics and plasticity support the evidence that they are mesenchymal stem cells with a distinct tendency for neural lineage. Background: The effects of antiepileptic drugs (AED) on bone health are well documented. Inadequate dietary intake of calcium and vitamin D plays a vital role and further compromises the bone health. Objective: To assess the dietary pattern with special reference to calcium and related minerals in people with epilepsy (PWE) on AED. Materials and Methods: The dietary assessment in PWE was documented by dietary recall method. Patients were categorized according to age: group I: <14 years; group II: between 15-20 years; group III: between 21-45 years; group IV: >46 years. From the raw weights, total energy, dietary calcium, dietary phosphorous intake and phytate calcium ratio was calculated using a food composition table by Indian Council of Medical Research (ICMR) and analyzed statistically. Results: A total of 362 patients with mean age of 29 + 15 years were studied. There were 190 women. The mean duration of AED treatment was 4 + 3 yrs, 64% on monotherapy 64% and 36% on polytherapy. The mean dietary intake of the total chohort was 2,007 + 211 Kcal/day, carbohydrate 335 + 33 gm/day; protein 31 + 7 gm/day; fat 18+2 gm/day; calcium 294 + 40 mg/day; phosphorus 557 + 102; phytates 179 + 30 mg/day; and phytate/calcium ratio 0.56+0.2. Milk and milk products were consumed by 42% of the total cohort. The daily dietary calcium (301 + 40 mg/day) intake of men was significantly higher than women (287 + 39 mg/day) (P < 0.001). This was more evident in group II (P < 0.01) and group III (P < 0.03). There was a positive correlation between dietary calcium and dietary phytates (P < 0.001), dietary proteins (P < 0.001), dietary fat (P < 0.001), and total energy (P < 0.001). Conclusions: The dietary consumption of calcium of all the patients was far below the recommended daily dietary allowance (RDA) by Indian Council of Medical Research (ICMR). Low dietary calcium could have a confounding effect on PWE on AED in all age groups. There is a need to formulate consensus guidelines to supplement dietary calcium to PWE. Background: Long-term therapy with antiepileptic drugs (AED) may be associated with increased total serum alkaline phosphatase (ALP) levels and reduced serum calcium, inorganic phosphorous, and vitamin D levels. These adverse biochemical alterations have an adverse effect on bone health Objective: To determine (a) onset of derangements in serum total ALP and its isoenzymes (liver, bone), calcium and 25-hydroxy vitamin D (25-OHD) concentrations after initiation of treatment with phenytoin or valproic acid monotherapy and (b) the effect of simultaneous supplementation with calcium and 25-OHD at recommended daily allowance (RDA) dosage, on these biochemical parameters. Materials and Methods: Study was a prospective, case-controlled study in adults. Serum biochemical parameters were estimated at baseline, 30, 60, and 90 days of starting AED treatment in the study subjects: Groups--A (only calcium supplementation) and Group B (both calcium and 25-OHD supplementation). Statistical Analysis: Mean±SD, and students' paired t test (between groups A and B) unpaired students' t test (drug-wise). Results: At 60 days of AED therapy Group A showed a significant increase in serum total ALP (78.83±11.04 to101.75 ± 9.56 IU/l) (P < 0.001), ALP-liver isoenzyme, (41.97± 10.81 to 68.83 ±7.81 IU/L) (P < 0.001), significant decrease in calcium (9.30 ± 0.36 to 8.80 ± 0.38 mg%) (P < 0.001), ALP-bone isoenyzme (36.84 ± 5.01 to 32.92 ± 6.46 IU/L) (P < 0.001), and a significant decrease in 25-OHD (25.19 ± 5.98 to 19.76 ± 5.35 ng/ml) (P < 0.001) at 90 days. In contrast Group B, at 60 days, showed a significant decrease in serum total ALP (81.92 ± 19.63 to 54.77. ± 11.53 IU/L) (P < 0.0001), ALP-liver isoenzyme (48.01. ± 13.53 to 28.12. ± 5.88 IU/L) (P < 0.0001), significant increase in calcium ((9.24 ± 0.31 to 9.93 ± 0.26 mg%) (P < 0.001) and ALP-bone isoenzyme levels (33.93 ± 12.2 to 26.25 ± 8.23 IU/L). 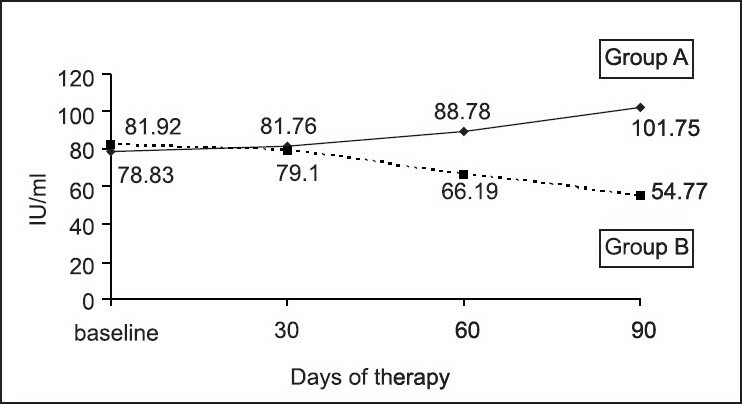 In Group B, 25-OHD levels showed a significant increase at 90 days (24.36 ± 3.42 to 31.53 ± 327 ng/ml) (P < 0.0001). Conclusion: Biochemical derangements in calcium metabolism involving the bone are seen by 60 days after starting AED monotherapy, indicating predisposition to development of osteomalacia in these patients. This is preventable by simultaneous oral supplementation with calcium and 25-OHD. Background: Abnormal psychometric tests are common in cirrhotic patients without overt encephalopathy. It may seriously impair the patient's daily functioning and quality of life. Prevalence of abnormal psychometric tests after the clinical recovery of overt encephalopathy has not been studied. 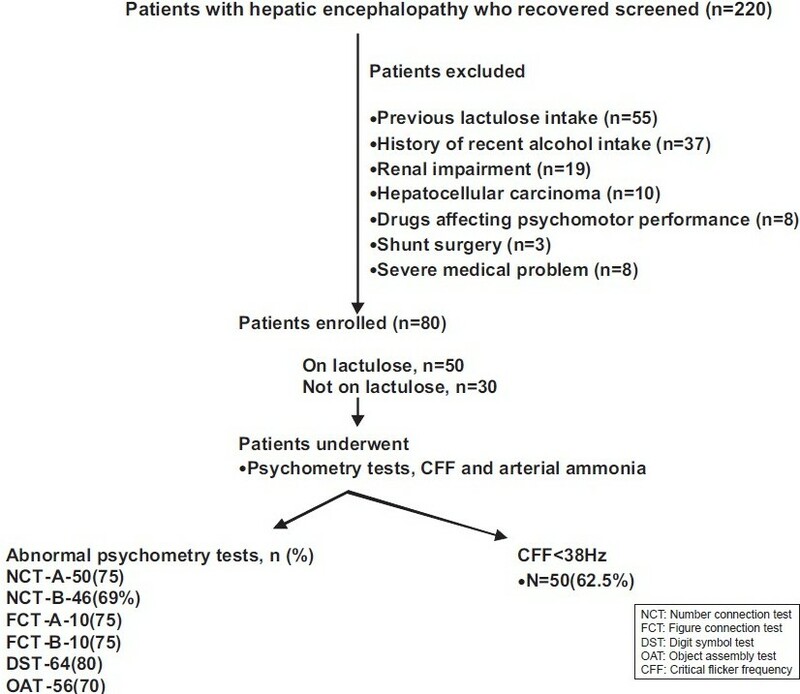 Materials and Methods: Consecutive 80 patients (age, 44.5±9.8yr; M: F 66:14) with hepatic encephalopathy (HE) who recovered and met inclusion criteria were evaluated for abnormal psychometric tests ( > 2 SD) and critical flicker frequency (CFF < 38Hz). All patients underwent number connection tests-A and B, figure connection tests -A and B (if illiterate), digit symbol test, object assembly test, CFF and arterial ammonia after one month of clinical recovery of HE. Results: Prevalence of abnormal psychometric tests (> 2SD) was seen in 58 (72.5%) patients. [33 (66%) of 50 patients on lactulose and 25 (83%) of 30 patients not on lactulose, P = 0.12]. Arterial ammonia was significantly higher in patients with abnormal psychometric tests compared to patients without it (86.3±22.2 vs 50.4±11.5 mmol/l, P = 0.01). CFF was < 38Hz in 50 patients (62.5%). Patients with ≥2 abnormal psychometric tests had CFF significantly lower than with normal psychometric tests (35.6±2.3 vs 40.7±2.4 Hz, P = 0.001). CFF sensitivity and specificity in diagnosing ≥2 abnormal psychometric tests was 82 and 83% respectively. CFF was significantly correlated with psychometric tests [NCT-A (-0.672, P = 0.001) and B (-0.743, P = 0.001), digit symbol test (-0.533, P = 0.001), object assembly test (-0.659, P =0.001) and arterial ammonia level (-0.385, P = 0.02)]. Conclusion: About 73% of patients who recovered from HE had abnormal psychometric tests ( > 2SD). CFF is a simple reliable tool to find out the presence of abnormal tests. 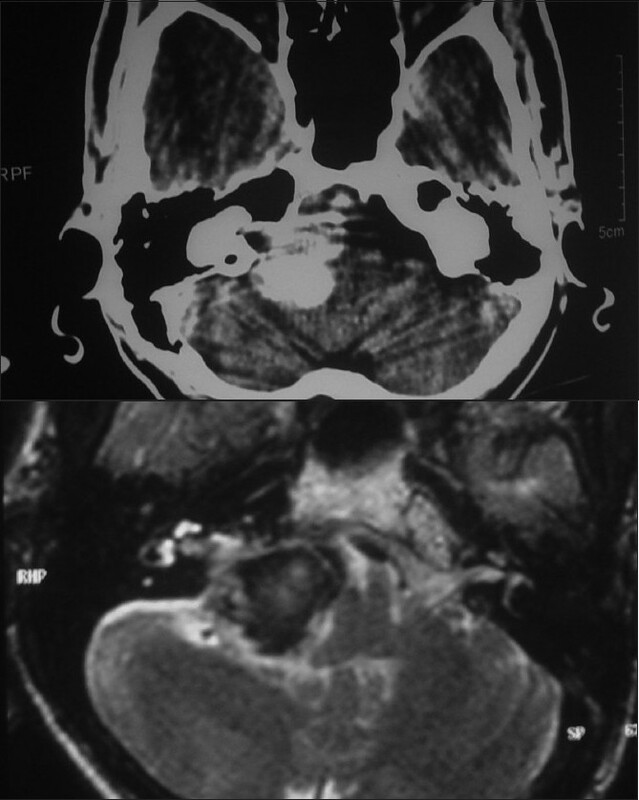 Background: Evidence from small case series suggests that the intrasinus thrombolysis (IST) is relatively safe and effective in rapid recanalization of thrombosed sinuses and reversal of neurological deficits in patients with cerebral venous and sinus thrombosis (CVST) However, in the absence of randomized controlled trials, the exact role of IST in the management of CVST is unclear, Aim: To study the safety and efficacy of IST in patients with CVST. Materials and Methods: Adult patients with CVST who received IST during a two-year period (January 2003-December 2004) were included. Data regarding demographic, clinical and radiological features were collected. Follow-up data were obtained at 3-6 months. Magnetic resonance venography (MRV) was repeated to assess the recanalisation of venous sinuses. Results: Nineteen patients (11 women) with a mean age of 32 years (range 17-46 years) received IST during the study period. Common clinical features at presentation included headache, altered consciousness and seizures. Indications for thrombolysis included clinical deterioration despite adequate anticoagulation and rapid worsening of consciousness or neurological deficits. Thirteen patients (68%) had dural sinus thrombosis alone and six others had coexisting deep venous system involvement. Venous infarcts were present in 13 patients. At discharge, 15 patients (79%) had good outcome and were either asymptomatic or had only mild deficits and were independent for activities of daily living. Three patients died and one survived with severe neurological deficits. Angiographic improvement (as per digital subtraction angiography) was noted in 12 patients (complete in five and partial in seven) and seven patients had poor or no recanalization of the involved venous sinuses. At a median follow-up of 6.3 months, 14 (74%) patients had no or mild neurological deficits. Conclusion: IST is safe and effective in patients with CVST who fail to respond to conventional medical treatment. However, the subgroup of patients who are likely to benefit the most from this procedure is not clear from our data. Large randomized controlled trials are required to further clarify this issue. Background: Radial nerve is the most frequently injured major nerve in the upper extremity. Proximal part of the radial nerve involvement can result from a humerus fracture, direct nerve trauma, compression and rarely from tumors. Objectives: The aim of the study is to determine the clinical characteristics and electrodiagnostic findings in patients with proximal radial nerve injuries, and also the outcome of surgical treatment. Materials and Methods: The study subjects included 46 patients with radial nerve injuries seen between June 2000 and June 2008 at our hospital. The analysis included demographics, clinical features, etiology, pre-and postoperative EMNG (Electromyoneurography) findings. Results: Surgical decompression resulted in neurological improvement in patients with radial entrapment neuropathies. Good neurological recovery was observed from decompression of callus of old humeral fracture. The worst results were observed in the direct missile injuries of the radial nerve. Conclusions: A detailed clinical and electrodiagnostic evaluation is of importance in patients with radial nerve injury to ensure an appropriate treatment. The choice of treatment, conservative or surgical, depends on the clinical presentation and the type of injury. Background: Distal myopathy with rimmed vacuoles (DMRV) is an autosomal recessive (AR) myopathy characterized clinically by the preferential involvement of the tibialis anterior and has been reported predominantly in the Japanese population. 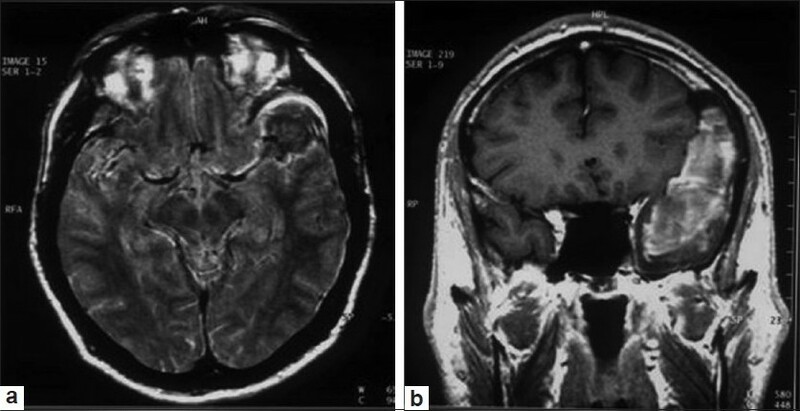 Materials and Methods: A case series of DMRV patients seen over a period of 3 years at a tertiary national referral center for neurological disorders in south India. Results: We describe the clinical characteristics, muscle magnetic resonance imaging (MRI) findings and classical histopathological feature in 23 patients. There were 12 men and 11 women. Mean age of onset was 27.04 ± 6.35 years (10-39 years). Onset was in the second or third decade in a majority. Mean age at presentation was 33.95 ± 6.35 years (25-48 years). Mean duration of illness was 6.74 ± 4.8 years (1-18 years). Consanguinity was reported in eight (34.8%) patients. The predominant and initial manifestation was bilateral foot drop in all patients. 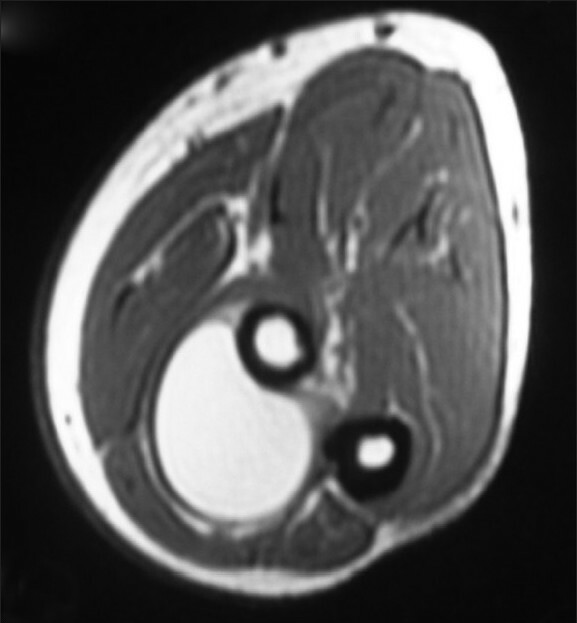 Muscle MRI demonstrated classical involvement of the anterior compartment muscles of the lower legs and the posterior compartment muscles of the thighs and the quadriceps was normal in all. Muscle histopathology showed numerous fibers containing rimmed vacuoles. Necrotic fibers or phagocytosis or regenerating fibers were rarely noted or were absent. Conclusions: DMRV is a rare AR myopathy. The disorder presents as progressive foot drop and hence has many differential diagnoses. It is easily mistaken as neuropathy of hereditary nature and hence it is extremely important to recognize the preferential muscle involvement and characterize the phenotype. 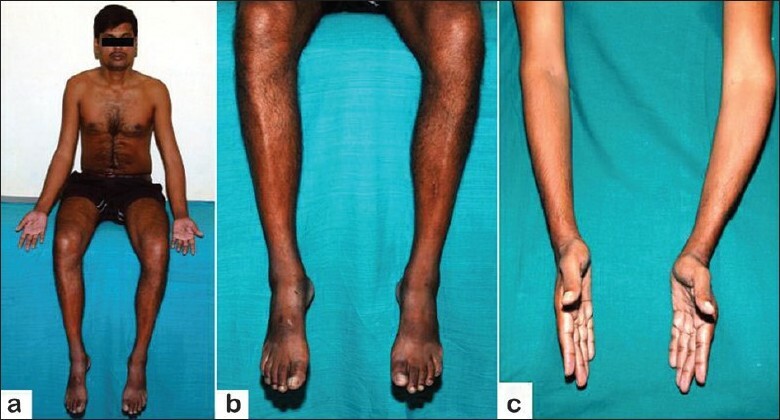 This is the first report from India with patients having characteristic phenotype of Nonaka's/AR hereditary inclusion body myopathy with quadriceps sparing, and all were confirmed by histopathology. Background: Aneurysms arising from the P 2 segment of the posterior cerebral artery (PCA) are rare, accounting for less than 1% of all intracranial aneurysms. To date, few studies concerning the management of P 2 segment aneurysms have been reported. 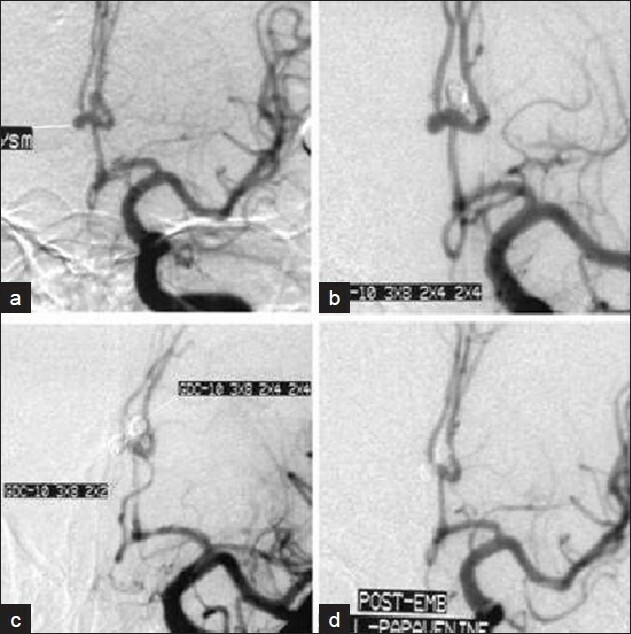 Objective: To review the microsurgical techniques and clinical outcomes of microsurgical treatment by different approaches in patients with aneurysms on the P 2 segment of the PCA. 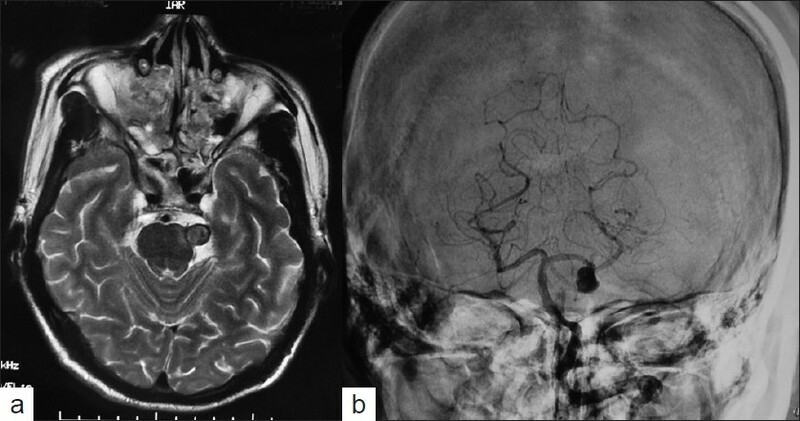 Materials and Methods: Forty-two patients with P2 segment aneurysms had microsurgical treatment by subtemporal approach. All the patients had drainage of cerebrospinal fluid for decompression, and indocyanine green (ICG) angiography was used in 20 patients to assess the effect of clipping. Results: Of the 42 patients, 16 were operated by combined pterional-subtemporal approach. In 40 patients aneurysms were successfully treated by clipping the P 2 aneurysmal neck while preserving the parent artery. Two patients with giant aneurysms were treated using surgical trapping. Postoperatively, 41 patients had a good recovery. One patient after aneurysm trapping had ischemic infarction in the PCA tertiary and presented with hemiparesis and homonymous hemianopia. However, this patient recovered after three weeks of treatment. Conclusion: Subtemporal approach is the most appropriate approach to clip the aneurysms of the P 2 segment. It allows the neurosurgeon to operate on the aneurysms while preserving the patency of the parent artery. Gaint P 2 segment aneurysms can safely be treated by rapping of the aneurysm by combined subtemporal or pterional-subtemporal approach in experienced hands.ICG angiography will be an important tool in monitoring for the presence of residual aneurysm or perforating artery occlusion during aneurysm clipping. Preoperative lumbar drainage of cerebrospinal fluid may help to avoid temporal lobe damage. Background: Epidural steroid injection (ESIs) is one of the treatment modalities for chronic low back pain (CLBP) with various degrees of success. Aim: We analyzed the efficacy of fluoroscopically guided transforaminal epidural steroid injections (TFESIs) via a preganglionic approach in patients with foraminal stenosis due to lumbar spinal stenosis and lumbar discogenic pain with radiculopathy. Materials and Methods: We analyzed the data of 40 patients (February 2008 and April 2009) with the diagnosis of CLBP and treated by fluoroscopically guided TFESIs via a preganglionic approach. Patients were followed-up at one month (short term), six months (midterm) and one year (long term) after injections. Follow-up data collection included the Visual Numeric Pain Scale (VNS) and North American Spine Society (NASS) patient satisfaction scores. Results: The mean age of the patients was 59.87 ± 15.06 years (range 30 - 89 years, 25 women). Average follow-up period was 9.22 ± 3.56 months. Statistically significant differences were observed between the pre-procedure and post-procedure VNSs (P < 0.01, Pearson Correlation Test). Improvements in VNS scores were correlated with improvements in the NASS scores. When the VNS scores were evaluated with respect to the age of patient, level numbers, gender, pre-procedure symptom duration and pre-procedure VNS, no significant differences were found (P < 0.05, linear regression test). At short term evaluation in post treatment (one month), 77.78 % of patients were found to have a successful outcome and 22.22 % were deemed failures. Overall patient satisfaction was 67.23 % in the midterm period. Additionally, 54.83 % of patients (N/n: 15/8) had a successful long-term outcome at a follow-up of one year. Conclusion: Our data suggest that fluoroscopically guided TFESIs via a preganglionic approach, in patients with foraminal stenosis due to lumbar spinal stenosis and lumbar discogenic pain with radiculopathy, has effective outcome and patients responding to injection have significantly lower post-injection pain scores. Background: Knowledge of the morphometric anatomy of the pedicles in thoracic spine is essential for the surgeon attempting thoracic pedicle screw placement. Aim: To study the morphometry of the pedicles in the thoracic spine in Indian subjects and note the anatomical landmarks required for safe and accurate pedicle screw placement. 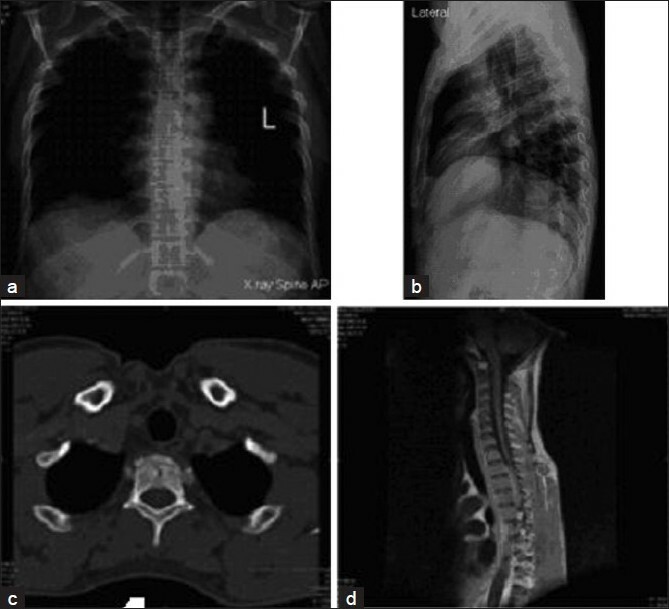 Settings and Design: An anatomico-radiological study with cadaveric confirmation was conducted in a medical college and tertiary care center. Materials and Methods: Morphometric anatomy of 720 pedicles from T1-T12 was studied. The study consisted of 15 separated thoracic vertebral cadavers and 15 computed tomographic scans of undiseased thoracic spine. Transverse and sagittal pedicle diameters, transverse pedicle angle, chord length and the pedicle entry point landmarks were studied. Using the results, accuracy of the pedicle screw placement was confirmed in 120 pedicles from five unseparated cadavers. Results: Transverse pedicle diameter was narrowest at T4 and gradually increased craniocaudally. Twenty-two percent of the pedicles from T4 to T6 were less than 4.5 mm, but none were less than 3.5 mm. 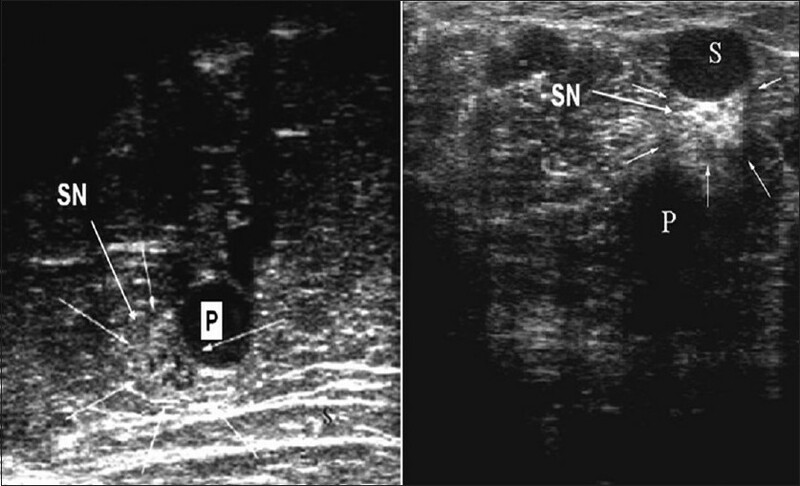 The transverse pedicle angle was widest at T1 (26.50) and decreased caudally to T12 (8.10). The chord length gradually increased caudally from a minimum of 30.4 mm at T1 to a maximum of 43.3 mm at T12. Landmarks (transverse and vertical distance) for the pedicle entry point were measured from the reference point taken as the center of the junction of lamina and the transverse process. The pedicle entry point was always superolateral to this reference point. Conclusion: Knowledge of the pedicle diameter and chord length is essential for choosing the appropriate pedicle screw, whereas the pedicle angle and the entry point are important for accurate screw placement. 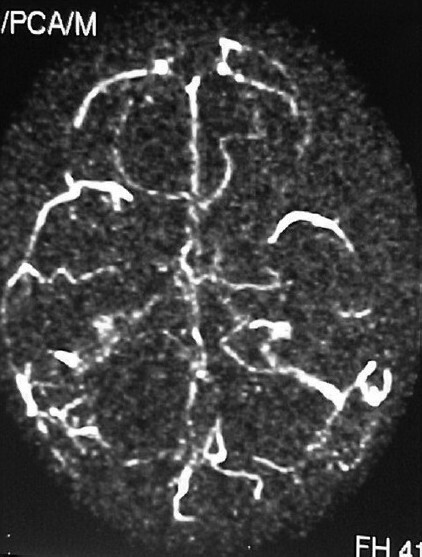 Background: Distal anterior cerebral artery (DACA) aneurysms are less common, accounting for 3.1 to 9.2% of all intracranial aneurysms.The clinical characteristics and surgical techniques are quite different from those of other aneurysms of Willis circle. Objective: We aimed to investigate the clinical and radiographic characteristics of ruptured distal anterior cerebral artery (DACA) aneurysms and the efficacy of endovascular treatment for these lesions. 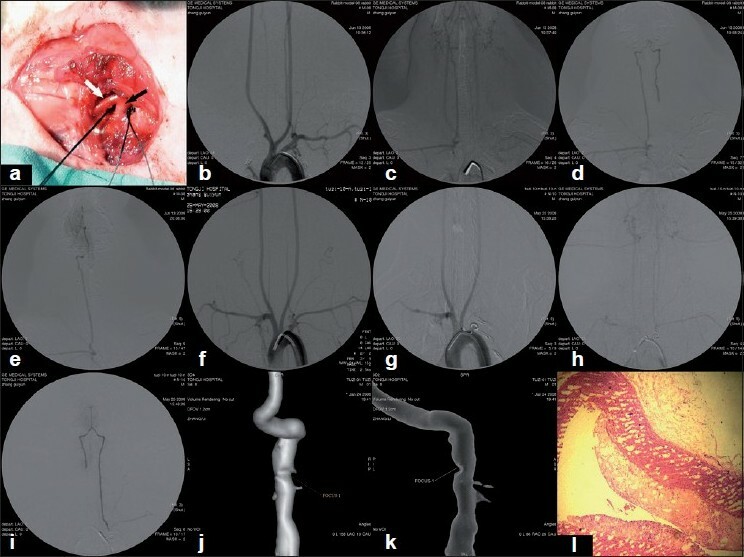 Patients and Methods: From 1998 to 2008, 41 patients with 44 DACA aneurysms were treated by endovascular coiling, including parent vessel occlusion using coils or coils combined with n-butyle-2-cyanoacrylate (NBCA) in two, endosaccular coiling alone in 39, and stent-assisted coiling in three. Results: Technical success was achieved in 40 (97.6%) patients. Among the 41 aneurysms successfully treated with endosaccular coiling or stent-assisted coiling, complete occlusion was obtained in 37, neck remnant in two, and partial occlusion in two. Two patients with poor pretreatment conditions died of cerebral vasospasm. The morbidity was 4.87%. One case each of unruptured recurrence and rebleeding were seen in follow-up DSA of 34 patients and MRA in five cases. Conclusion: Our preliminary results show that endovascular treatment for DACA aneurysms is safe and effective. However, the relative high recurrent rate highlights long-term follow-up for its security. Background: The nature and extent of recovery after traumatic brain injury (TBI) is heterogeneous. Apolipoprotein E (APOE) plays a major role in repair of cell membrane and growth of neurites following injury to cells. Studies done on the western population have shown that the APOE e4 genotype is associated with poor survival following neurotrauma. 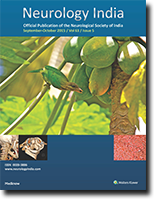 Aim: To explore the association of APOE polymorphism and outcome following TBI in a patient population from a tertiary care hospital exclusive for neurological diseases in south India. 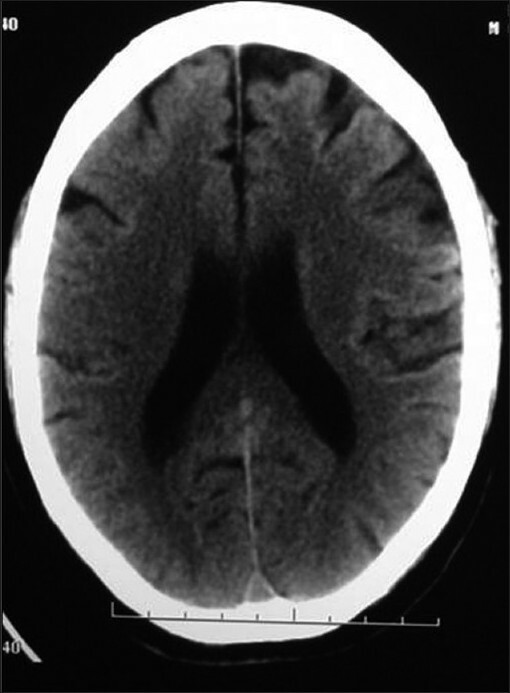 Patients and Methods: Ninety eight patients who sustained mild to moderate TBI (computed tomography (CT) scan brain showing traumatic parenchymal contusions) were the subjects of the study and the study period was from November 2003 to December 2008. APOE polymorphism status was determined by PCR technique using venous blood. Patients were assessed on follow-up with a battery of four neuropsychological tests as well as Glasgow outcome scale. Results: Of the 98 patients, 20 (20%) patients had at least one APOE e4 allele. A follow-up of minimum six months was available for 73 patients. None of the12 patients who had at least one APOE e4 allele had a poor outcome at six-month follow-up whereas 11(18%) patients without an APOE e4 allele had a poor outcome (Fisher's Exact test, P=0.192). On the neuropsychological tests, performance of patients with APOE e4 allele did not differ significantly from those without these alleles. Conclusion: This study does not support the current contention that the presence of APOE e4 allele should have a significant negative effect on the outcome after TBI. Background: Increased incidence of fungal infection has been reported globally in the recent years. Fungal infection of the central nervous system remains one of the most difficult diseases to treat and requires multi-modality intensive therapeutic strategies. Materials and Methods: Retrospective analysis of case records of patients with confirmed skull base fungal granuloma treated at a tertiary hospital between 1988-2008. An attempt was made to stage the extent of skull base fungal granuloma based on neuroimaging, operative findings and course of the disease on serial follow-up. Results: Thirty-three patients with skull base fungal granuloma were treated surgically during the study period. The mean age at presentation was 33.2 years and diabetes was a major predisposing factor. Eight patients expired in the first two months following surgical intervention due to flare-up of the disease. Eighteen patients who underwent grossly total excision had a mean progression-free survival (PFS) of 43 months and seven patients with subtotal excision had a mean PFS of 23 months. Better survival probability was noted in those patients who underwent total excision at surgery and received complete course of amphotericin. Conclusion: Total surgical excision with complete course of antimycotic drug therapy increases PFS. A better antimycotic drug with less toxicity and high efficacy with fungicidal property can make a difference in the outcomes of the disease. Nerve conduction studies (NCS) aid in the detection of foot nerve pathologies. However, there has been a debate on method of plantar nerves stimulation that is more effective; the ring method of stimulation or probe method of stimulation. This study aims at determining the one method that is more effective among the two methods of stimulating for eliciting proper responses. Thirty healthy adults, aged 19 to 55 years, free of any neurological disease were the subjects of the study. Values considered for determining the effectiveness of the stimulating technique were mean amplitudes of the evoked responses from medial and lateral plantar nerves. 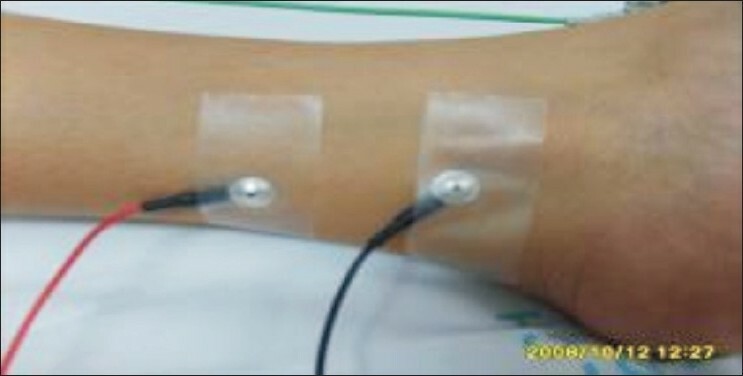 A significant increase in amplitude difference was noted in favor of the probe stimulation method. The amplitude difference noted in favor of the probe method of stimulation was double the values elicited by the ring method of stimulation in both the medial and lateral plantar nerves. Results suggest that the direct probe method of stimulation may be a more effective method of stimulating for the medial and lateral plantar nerves studies. Surgical options for suprasellar arachnoid cyst are cystoperitoneal shunt, craniotomy fenestration and endoscopic fenestration. Endoscopic management has been found to be safe and effective. We report our experience with endoscopic management in 12 (male five, female seven; age range 8 months to 42 years) patients with suprasellar arachnoid cyst. The endoscopic procedure included lateral ventricle puncture by precoronal burr hole and superior and inferior wall of the cyst was communicated with the lateral ventricle and the interpeduncular cistern respectively. All patients had hydrocephalus. Four pediatric patients had macrocephaly. All adult patients had visual disturbances. 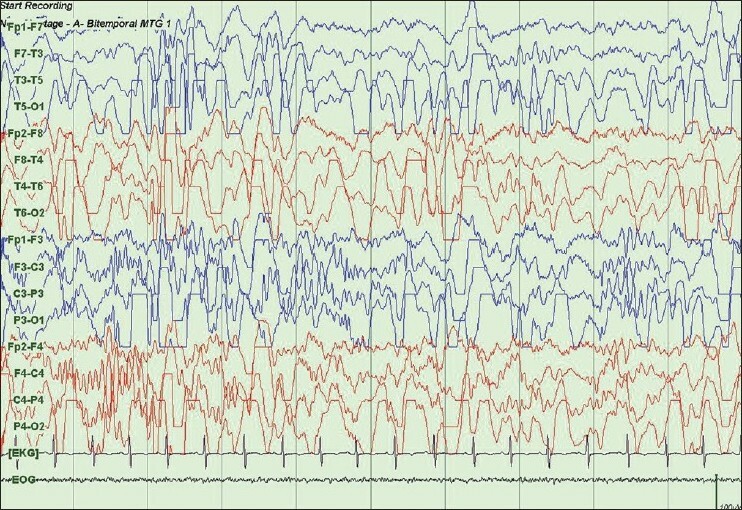 One adult patient presented with psychomotor disturbance along with features of raised intracranial pressure. All cases improved following endoscopic treatment. There were no complications or death. One patient required VP shunt. Postoperative MRI showed significant reduction in cyst volume in 11 patients. Follow-up ranged from 6 months to 6 and a half years. Our study suggests that endoscopic technique is a safe and effective alternative treatment for suprasellar arachnoid cyst. It prevents complications such as subdural effusion and intracranial hematoma, which are not uncommon with craniotomy fenestration. Topiramate could potentially effective as prophylaxis for cluster headache, but the experience remains limited in Asians. We performed an open-label clinical study to evaluate the efficacy of topiramate in the tolerable dosage to prevent cluster headache. We studied patients who fulfilled the criteria of episodic or chronic cluster headaches (International Classification of Headache Disorders second edition) prospectively. Headache severity was assessed using a verbal rating scale (excruciating, severe, moderate, mild, and no headache). Treatment was started with a topiramate dose of 50 mg twice daily and was increased by 50-100 mg a day every 3 to 7 days as tolerated to a maximal daily dosage of 400 mg. Of the 12 patients with episodic cluster headache, nine patients had remission of headache at a mean daily dosage of 273 mg (range 100-400 mg ), and the patient with chronic cluster headache had remission at a daily dosage of 400 mg. The adverse effects included: paresthesia (84%), slow speech (54%), and dizziness (46%), but were tolerated by most patients. Two patients discontinued topiramate due to adverse events and one due to lack of efficacy. This open-label study suggests that topiramate is effective in the treatment of cluster headache in Taiwanese patients. Hemorrhagic juxtafacet synovial cysts have rarely been reported in the literature. We reviewed case records of eight patients with hemorrhagic juxtafacet cysts treated surgically. Back pain and acute radicular pain were the presenting features in the all patients. The possible cause for hemorrhage could be indentified in only three patients. Six patients had medial facetectomy and hemilaminectom and two patients with stenosis had medial facetectomy and laminectomy. Following surgery there was immediate relief from pain with significant improvement of the Oswestry disability index (ODI). Six patients had an excellent outcome while the remaing two patients had a good outcome. During the follow-up there was no progression of slippage, no segment instability, and no recurrence. Hemilaminectomy or laminectomy with medial facetectomy without fusion might serve as an effective and safe management strategy to treat lumbar hemorrhagic juxtrafacet synovial cysts. Endovascular treatment with coils of cerebral aneurysm is being increasingly used for definitive treatment. An increasing number of patients are coming for surgical intervention either for recurrences, incomplete coil embolization or its complications. Our objective was to assess the surgical management in such patients. This was a retrospective analysis of the patients who were initially treated with endovascular embolization and later managed surgically with clipping either for unsuccessful coiling, recurrence of aneurysm or post-procedural complication, between 2003 and 2007. Anatomical results were excellent in all five patients, and all the aneurysms were totally excluded from the circulation. All patients had good recovery. None of the patients suffered any major intraoperative or postoperative complication. Neurosurgical management of intracranial aneurysms previously treated with endovascular therapy is an emerging challenge, but with proper patient selection and careful planning, this subset of aneurysms can be managed with good results. Actinomycosis is an indolent, slowly progressive infection caused by Actinomyces species. 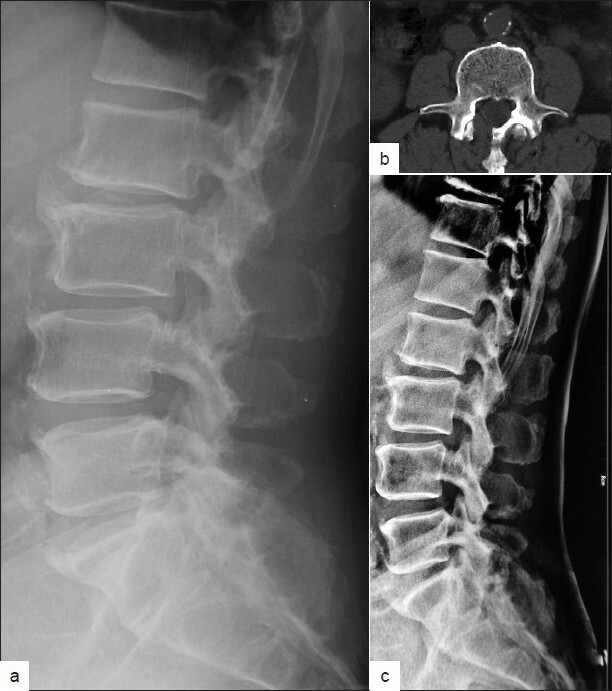 Of human actinomycosis, the spinal form is rare and actinomycosis-related spinal neurological deficit is uncommon. We report two cases with cervical and dorsal actinomycosis and one of them with spinal neurological deficit. Cryptococcus neoformans is a rarely reported cause for osteomyelitis. We report an extremely unusual case of calvarial cryptococcal osteomyelitis in a 42-year-old sub-optimally immunocompetent male. This case discusses the atypical presentations of cryptococcosis in HIV-negative patients and its importance of early diagnosis. The treatment option for varicose veins (VV) is mainly surgery both open and minimally invasive. Even though mortality and major morbidity are rare with surgery, minor neurological complications like cutaneous nerve injuries remain a common problem. 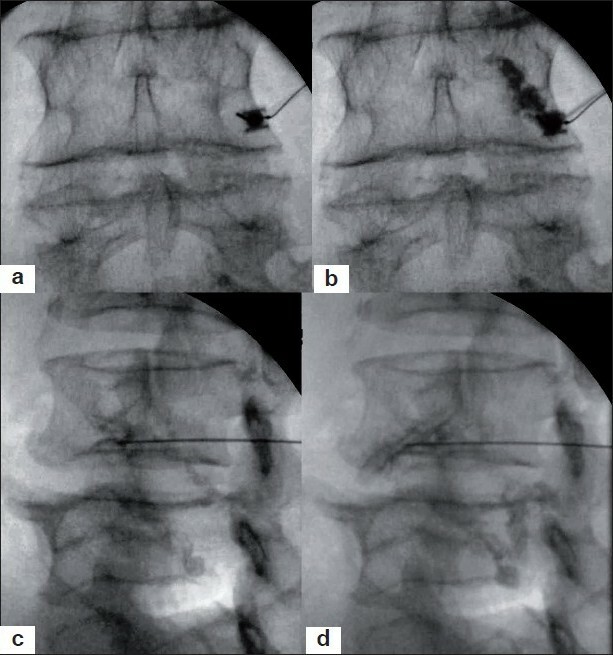 Involvement of major branches of sciatic nerve is extremely a rare complication of radiofrequency ablation (RFA), the other treatment option for VV. 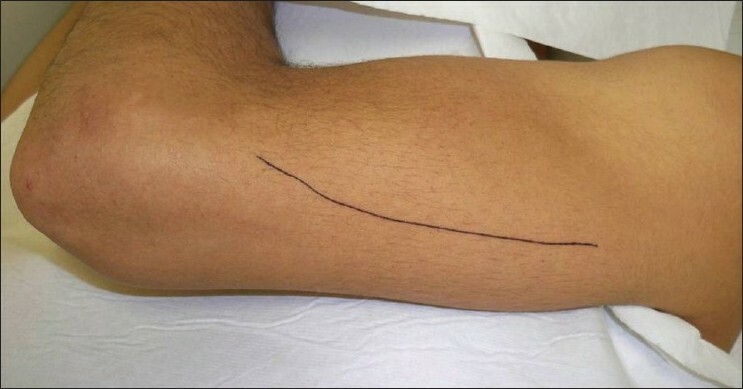 To the best of our knowledge, injury to both peroneal and tibial nerves has not been reported following RFA procedure. We report a very rare complication of sudden onset foot drop after RFA for VV. Lack of knowledge of such symptoms may lead to misdiagnosis and electrodiagnostic and magnetic resonance imaging studies can help in correct diagnosis. Alien limb phenomenon is associated with different neurological disorders, such as stroke and corticobasal degeneration. It is usually caused by involvement of the corpus callosum, with or without the frontal regions. Rarely, it can result from insult in the posterior cerebral artery territory. Alien limb phenomenon is generally persistent. Here, an unusual case of transient alien hand phenomenon is reported. Lhermitte-Duclos disease (LDD) is a pathologic entity with progrediating, diffuse hypertrophy chiefly of the stratum granulosum of the cerebellum. 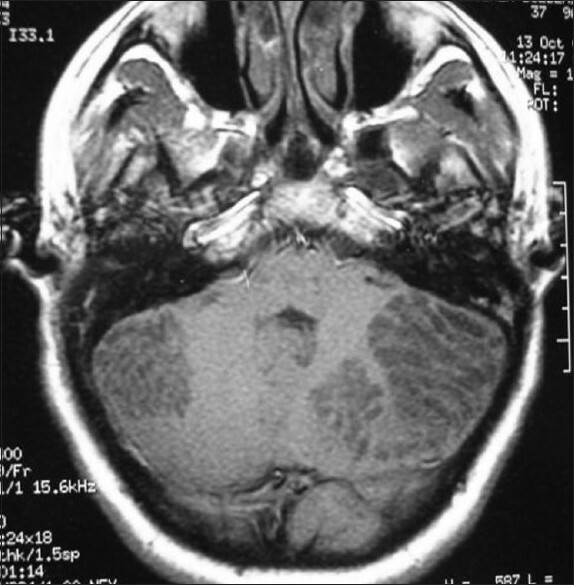 Typically LDD is a unilateral lesion of the cerebellum or in vermis. Here we report a case of LDD with bilateral lesions of cerebellar hemispheres managed surgically. A 28-year-old woman presented with one-year history of progressive headache, nausea, vomiting, and blurred vision. Neurologic examination revealed a bilateral mild papilledema, mild dysmetria, and dysdiadochokinesia. 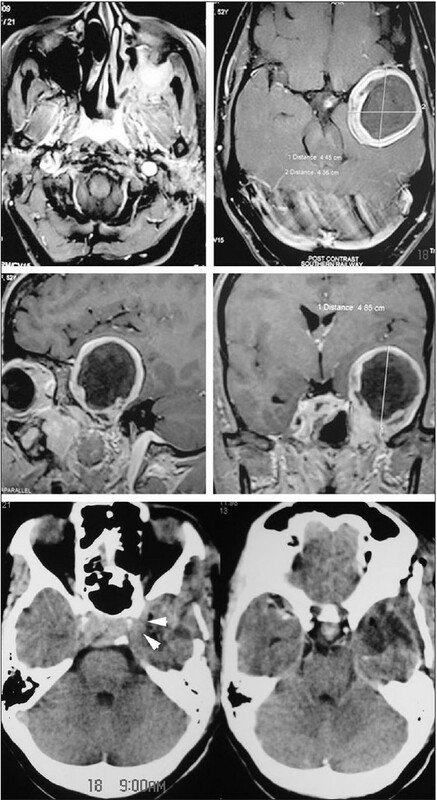 The cerebellar lesions caused moderate mass effect in posterior fossa with hydrocephalus, and Chiari type I malformation. 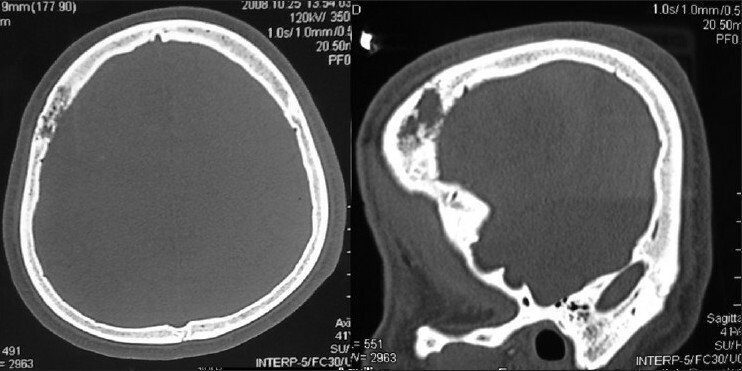 We performed the suboccipital-retrosigmoid approach, and removed completely the left intracerebellar mass. Symptoms related to elevated intracranial pressure disappeared in a short period postoperatively. Arachnoid cysts are developmental anomalies which are usually asymptomatic. Intracystic hemorrhage after trauma is a well known complication; however, spontaneous intracystic hemorrhage is rare. 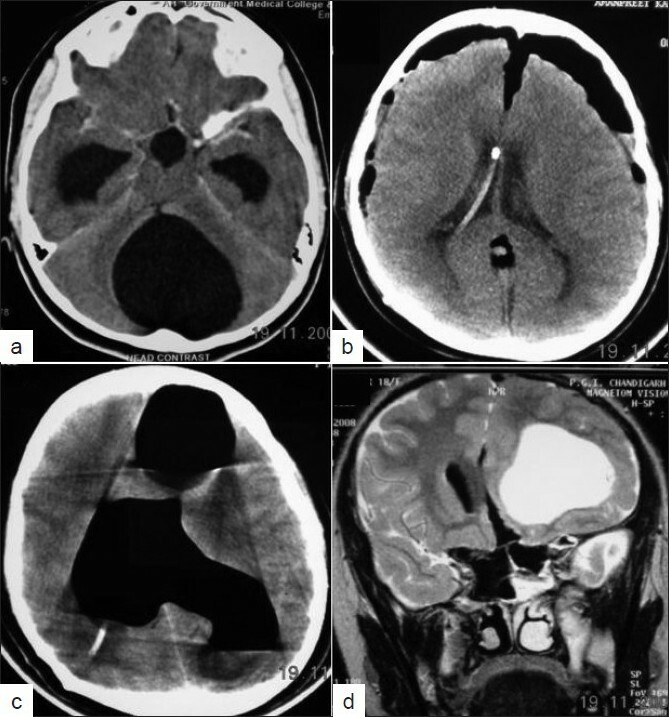 This report presents two rare cases of arachnoid cyst complicated by spontaneous intracystic hemorrhage. 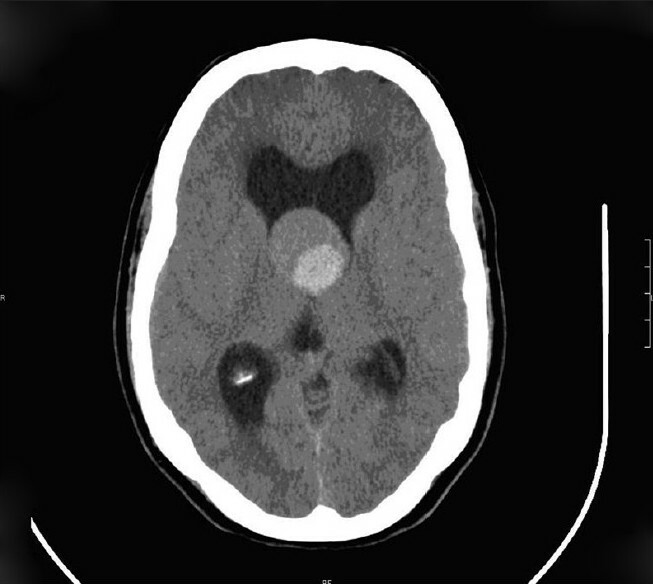 The first patient was admitted following transient loss of consciousness and speech disturbance, and a subacute subdural hematoma at the left temporal region was diagnosed. The second patient presented with severe headache of four days duration and a subdural hematoma at the left temporoparietal region was diagnosed. In both the patients, both on radiological examination and during surgical intervention, hematomas were found to be intracystic. Even though many cases of pituitary fibrosarcoma (PF) have been reported, the etiologic classification of these tumors, however, remains undefined. Moreover, owing to the paucity of available case studies, the clinical characteristics of primary pituitary fibrosarcoma (PPF) have not been fully described. 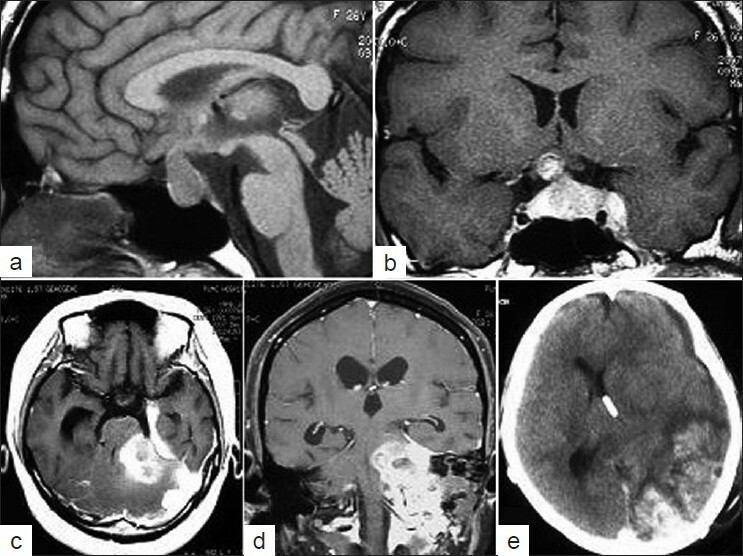 We report a 26-year-old female with pathologically confirmed PPF, who presented with features of elevated intracranial pressure, oculomotor nerve palsy, field defects and panhypopituitarism. 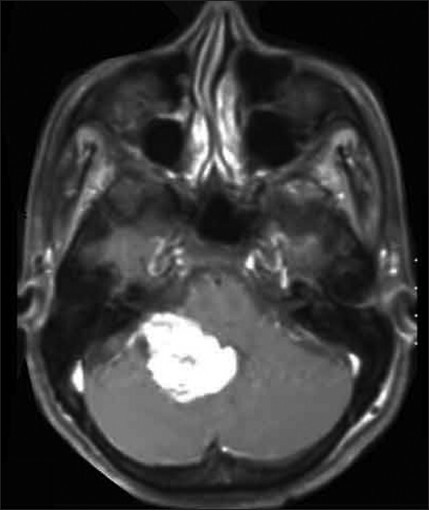 Despite the combination therapy, which included tumor removal, radiotherapy, and chemotherapy, magnetic resonance imaging demonstrated multiple intracranial and extracranial metastases at a seven-month follow-up, and the survival duration from diagnosis was only 11 months. Based on a review of the literature, we propose preliminary etiologic classification criteria for PF as well as a new therapeutic approach to reduce PPF recurrence and metastasis, including extended surgical resection and postoperative whole-brain radiotherapy.